“Did you enjoy your vacation?” Yes, that is what some of my friends asked upon seeing my pictures from the Appalachian Brewery, Hershey Park and Hershey Chocolate World. Although all of those experiences were part of my week (and the more exciting shots to post on Facebook), from July 9-12, I was in Hershey, PA at the National Association of Agricultural Educators Region VI Conference. This is how I spend my “free” time in the summer, pursuing professional growth and development opportunities. I am one of those educators who although grateful that my school paid the registration fee, had to reach into my own pocket to cover lodging and meals. Why do I do it? Partly because as a professional who believes in the NAAE Creed, I live the line that reads “I will endeavor to develop professionally through study, travel and exploration.” It is my responsibility as an educator to be engaged in continual improvement. Below is a snapshot of what my experience included. So, what exactly happens at a regional conference? Goody Bag Welcome: If you are lucky, you get welcomed with a goody bag. In Pennsylvania, this amazing treat had an assortment of teaching resources, local foods, a conference t-shirt, and my notebook with information about the event. Workshops: I had the chance to choose from nearly 30 different workshops that would meet my needs. 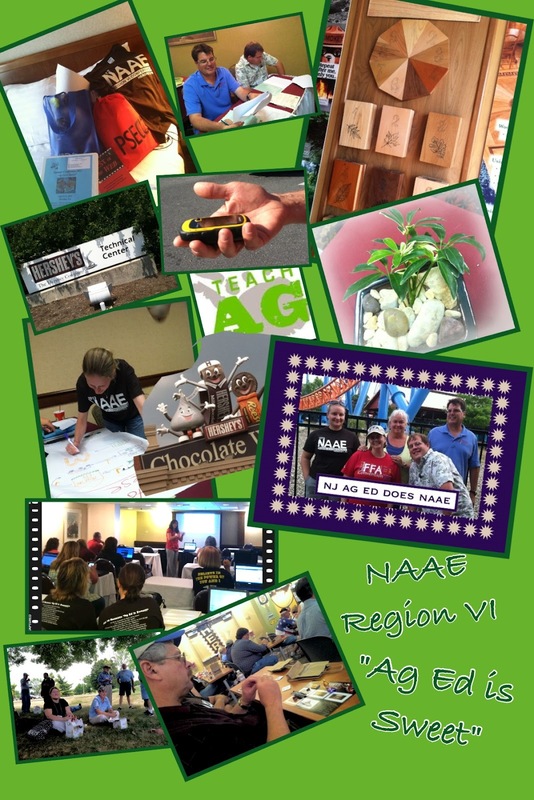 This year I engaged in workshops that connected me to resources to better implement technology in the classroom, provided a richer understanding of the environmental and natural resources career development event, explored strategies to use inquiry in food science units and gave me a better understanding of features of the virtual NAAE Communities of Practice. I walked away from these workshops with some amazing resources including a GPS unit, wildlife ID books, a bonsai I created, and more! Tours: This was not an easy decision as there were four quality tours including food science, equine science, production agriculture, and then a plant science/ animal science option. Being a fan of chocolate, I opted to tour the Hershey Research Facility and then experience the chocolate tasting at Hershey Chocolate World. I even got to sit next to our NAAE Region VI Vice President. Taking care of business: Regional conferences are not all workshops, tours and networking though. Part of the experience includes serving the profession. In addition to attending regional business meetings, this year I also chaired the Region VI Member Services Committee and served on other committees, as well as engaged in judging NAAE Applications. Vendors and Displays: I almost wished that I lived in PA and had access to their WoodMobile when I visited this roving resource. I also had the chance to talk to an assortment of people about products to support what I do as an educator. Vendors usually mean some “freebies” to take home. Have you been to a regional or national conference for your profession? What is your favorite part?